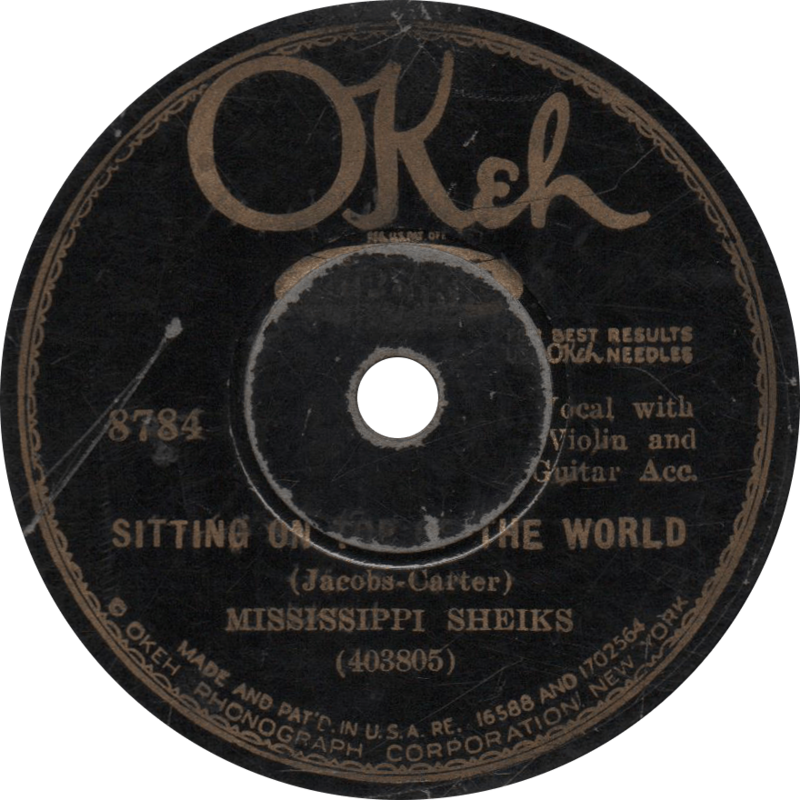 Few songs in the vast and diverse country blues tradition have had such an enduring impact, and few melodies known such ubiquity, as the Mississippi Sheiks’ legendary 1930 recording of “Sitting On Top of the World”. Yet in spite of its great import, the song’s origins are quite obscure. Thus, I endeavor herein to unravel the tangled roots of one of America’s greatest blues songs. I do ask that if you readers have any greater insight into the song’s history than I have to offer, please let me in on it by commenting on this post. The Mississippi Sheiks—Bo Carter, Lonnie Chatmon, and Walter Vinson—pictured in the 1937 Bluebird catalog. The Mississippi Sheiks were a versatile country string band with a repertoire consisting of everything from deep plantation blues melodies to the latest Tin Pan Alley pop hits. Though its personnel varied from session to session, core members were Lonnie Chatmon on fiddle and Walter Vinson on guitar. Sometimes, they were joined by other Chatmon brothers Sam and Armenter—better known as Bo Carter—or mandolin player Papa Charlie McCoy, brother of Kansas Joe McCoy. The Chatmon family of Bolton, Mississippi had a venerable musical history in the region. Patriarch Henderson Chatmon, born into slavery around 1850, was a fiddle player, and he passed his legacy of music on to his sons Lonnie, Bo, Sam, Harry, and reputedly Charley Patton by a different mother. Lonnie Chatmon was born either in June of 1888 or on November 8, 1890. He provided the heart of the Sheiks as their main fiddle player, remaining ever-present through all the Sheiks sessions and varying membership. Guitar picker Walter Vinson, sometimes called Vincent or Vincson, and credited pseudonymously as Walter Jacobs, was born on February 2, 1901, also in Bolton. Prior to becoming a Mississippi Sheik, he played alongside such noted talents as Charlie Spand, Rube Lacey, and the aforementioned Papa Charlie McCoy. He made his first records with Bo Carter for Brunswick in 1928, also Carter’s first. 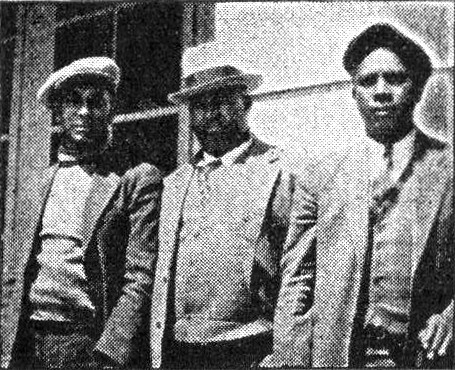 Following in the footsteps of similar Bo Carter and Walter Vinson groups of 1928 and ’29, the Mississippi Sheiks had their first recording session in Shreveport, Louisiana in February of 1930 for Okeh, and continued to record exclusively for them through 1931, with several of their records released in the 45000 “hillbilly” series rather than the 8000 “race” series, and their two final discs appearing on the parent label Columbia. While at Okeh, the Sheiks accompanied “Texas” Alexander in a single San Antonio session. Meanwhile, offshoot groups such as the Mississippi Mud Steppers and Mississippi Blacksnakes, both featuring Charlie McCoy, cut several records for Okeh and Brunswick. Thereafter, they traveled to Grafton, Wisconsin to make a series of records for the faltering Paramount label in July of ’32 before returning to Okeh in ’33 for a single session while the record industry was in dire straits. The following year, they signed with RCA Victor’s new up-and-comer Bluebird, with whom they remained until their final session in 1935. Lonnie cut several more records for Bluebird late in 1936 with brother Sam Chatmon, who had participated in a handful of earlier Sheiks sessions, before calling it quits. After the days of the Mississippi Sheiks had drawn to a close in the middle of the 1930s, the Chatmons, excepting Bo, quit music and returned to a life as farmers. Lonnie Chatmon died around 1942 of ’43. Walter Vinson and Bo Carter continued to enjoy solo recording careers into the 1940s. Bo Carter made some (as yet unreleased) final recordings for Paul Oliver in 1960 with Will Shade and Dewey Corley of the Memphis Jug Band, and died four years later at the age of seventy-one. Walter Vinson too returned to music in 1960, making a rather more successful comeback than Carter, before retiring for the last time in 1972, owing to atherosclerosis, three years before his death. Sam Chatmon spent many years working on plantations in Mississippi before the folk revival of the 1960s brought him back to the spotlight with great success, dying at the age of 86 in 1983. 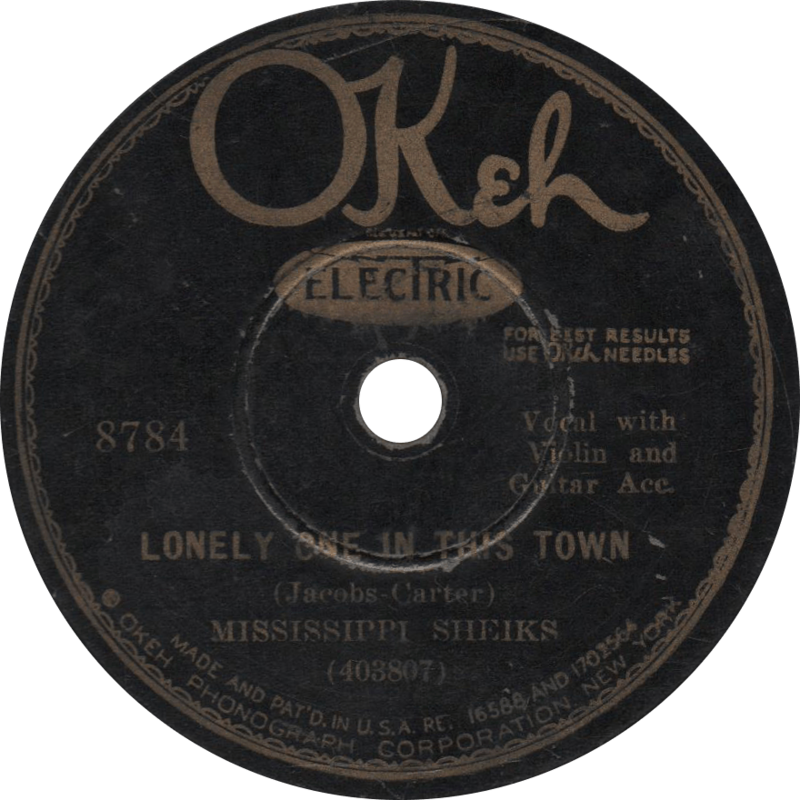 Okeh 8784 was recorded at the Mississippi Sheiks’ first session on February 17, 1930 in Shreveport, Louisiana. The Sheiks are Walter Vinson (a.k.a. Walter Jacobs) on guitar and vocal, Lonnie Chatmon on fiddle, and on the second side, Bo Carter on second guitar. It is the Sheiks’ second issued record. Without a doubt the Sheiks’ greatest success—then as now—is “Sitting on Top of the World”. The Walter Vinson and Lonnie Chatmon accredited composition has subsequently been covered by dozens, if not hundreds of artists, and was inducted into the Grammy Hall of Fame in 2008. After proving to be one of the biggest “race” hits of 1930, the Sheiks followed up with “Sitting on Top of the World No. 2” (Okeh 8854) in 1931 and “The New Sittin’ on Top of the World” (Paramount 13134) in ’32. Bearing no resemblance to the 1926 popular song “I’m Sitting on Top of the World” besides its title, the unmistakable melody of “Sitting on Top of the World”, or a very similar one, was used by quite a number of recordings prior to the Sheiks’ 1930 waxing. Where exactly and from whom the melody originated is considerably more difficult to pin down than simply citing some of the many songs to use it. Walter Vinson claimed to have written the song after playing for a white dance. Ida Cox recorded “How Long, Daddy, How Long” in 1925 with a like melody, accompanied by Papa Charlie Jackson, the composer credited as “W.H. Jackson”. Leroy Carr made that song famous three years later with his influential “How Long – How Long Blues”, and reused the melody in his “You Got to Reap What You Sow” only two months later. Some have suggested that the Sheiks were introduced to the melody by way of Tampa Red and a song he recorded several times called “Things ‘Bout Coming My Way”, however I am dubious of that prospect; the earliest recording of “Things ‘Bout Coming My Way” was cut on January 17, 1931 by one “Sam Hill” from Louisville—apparently a pseudonym for Walter Vinson—for Brunswick records, at the same session as the Sheiks’ offshoot the Mississippi Blacksnakes. Tampa Red made his first recording of the song the following month, with the composer credited as “Sam Hill”. The Sheiks themselves recorded the song later in that year. However, prior to every recording of “Things ‘Bout Coming My Way”, the Atlanta-based fiddler Eddie Anthony recorded the very similar “Everything’s Coming My Way” in December of 1930, with the same melody, borrowing some lyrics from “Sitting on Top of the World”. To complicate matters further, the 1941 Sam Price and his Texas Bluesiscians recording of “Things ‘Bout Coming My Way” perplexingly credits Bert Johnson and Spencer Williams as composers. Contemporaneous to the Sheik’s “Stitting On Top of the World”, a version was cut by Charley Patton, an associate of the Sheiks, only a few months after theirs under the title “Some Summer Day”. Big Bill Broonzy used the popular melody in his two-parter “Worrying You Off My Mind” in 1932, and Robert Johnson too echoed it in his 1936 “Come On in My Kitchen”. Milton Brown introduced the tune into the western swing repertoire with his 1934 recording titled “Just Sitting on Top of the World”, which was in turn covered by Bob Wills and others. Sitting on Top of the World, recorded February 17, 1930 by the Mississippi Sheiks. Though a little worse for wear, owing to a touch of groove stripping, the Sheiks give us some more of their good stuff, with Bo Carter sitting in, on the less well-remembered, but nonetheless excellent “Lonely One In this Town”. Lonely One In this Town, recorded February 17, 1930 by the Mississippi Sheiks.